Xylitol is a low-calorie sweetener made from birch wood. Chemically, it belongs to sugar alcohols, which are poorly digestible carbohydrates. Xylitol occurs naturally in small amounts (0.2-1 g/100 g dry solids) in yellow plums, strawberries, raspberries, bilberries, cauliflower, endive, lettuce and spinach [2-p.295]. Semi-artificially produced xylitol can be used as a low-calorie sweetener in chewing gum, gum drops, hard candies, breath mints, lollipops, chocolate, ice cream, cookies, “sugar-free honey,” diet soda and other drinks, jams and jellies . Xylitol can be used as a sugar substitute for sweetening tea or coffee. In the European Union, xylitol is labeled as E number E967 . Throat lozenges, mouthwash, toothpaste, cough and multivitamin syrups . Teeth-protection gels for infants and toddlers are on the market. Nasal sprays and irrigation solutions to use with neti pots are available. As a food additive xylitol can be produced by adding hydrogen to a monosaccharide xylose, which is made from corn cobs, sugar cane or birch wood ─ from here the other name for xylitol: birch sugar . Xylitol, in small amounts, is also produced in the human body [2-p.295]. Only up to 50% of the ingested xylitol is absorbed in the small intestine, the rest passes to the large intestine where it is fermented by the beneficial colonic bacteria to short-chain fatty acids (SCFA) and gases [2-p.302]. The unabsorbed xylitol attracts water from the intestinal wall so it can cause diarrhea if consumed in excess. 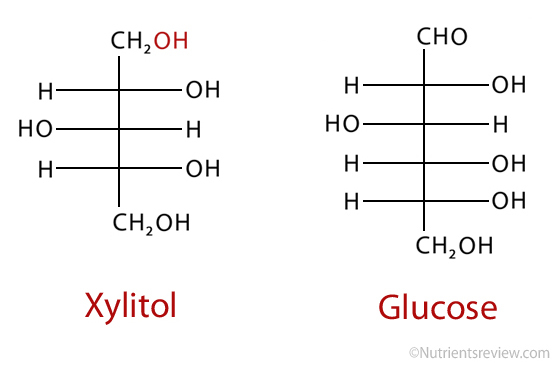 Once absorbed, xylitol can be metabolized and can provide 2.4 kilocalories per gram or it can be converted to glycogen (the glucose store in the liver) [2-pp.59,302]. Tooth decay. The bacteria in the tooth plaque cannot convert xylitol into acids, so xylitol does not promote dental caries [2-pp.308-311]. According to few recent systematic reviews of studies, there is a weak evidence that xylitol gum or lozenges can help prevent dental caries [14,15,16]. Xylitol appears to be more effective than sorbitol in preventing caries [17,18]. Xylitol may promote remineralization of initial caries lesions [20,21], but it does not likely reverse established cavities. Dry mouth. In some, but not all, studies, xylitol chewing gum, toothpaste, tablets, mouth rinse or gels stimulated saliva flow and improved dry mouth [12,19]. Diabetes mellitus. Xylitol has a low glycemic index (GI = 12), which means it does not raise the blood glucose levels significantly, so it may be a suitable sweetener for diabetics [2-p.9]. Infection of the middle ear in children. According to 2 systematic reviews of studies, regular xylitol consumption in the form of chewing gum, lozenge or syrup can decrease the risk of the infection of the middle ear (otitis media) in children [9,10]. Chronic sinusitis. In one small controlled clinical trial, nasal irrigation with xylitol solution resulted in greater improvement of chronic sinusitis symptoms than irrigation with saline . Xylitol stimulates the growth of the beneficial colonic bacteria that produce butyric acid, a type of short-chain fatty acid, that may be beneficial for colonic lining cells [2-p.311]. Xylitol is currently not considered a prebiotic, though. In one study, xylitol (25 g) added to a solid meal increased satiety , but it is not clear if it can help in weight loss . There is lack of research about eventual xylitol effectiveness in prevention of heartburn, urinary tract infections (UTI). According to Federation of American Societies for Experimental Biology (FASEB), xylitol is safe for use by humans . Xylitol has the “Acceptable Daily Intake (ADI) not specified” status by The Joint Food and Agriculture Organization/World Health Organization Expert Committee on Food Additives (JECFA), which is the highest safety category . Currently, xylitol is not listed as Generally Recognized As Safe (GRAS) by the US Food and Drug Administration (FDA). Xylitol is a pregnancy category B substance, which means no harmful effects were found in animal studies but there is a lack of human studies . Xylitol in doses up to 50-70 g/day for healthy adults or up to 20 g/day for healthy children is probably well tolerated [2-pp.304,320;22]. Larger doses may cause stomach upset, loose stools, abdominal bloating, pain or cramps and excessive gas (flatulence). The laxative effect of xylitol differ from person to person and may decrease or disappear with the regular use in 4-5 days. Xylitol is available as a powder, granules, liquid, syrup and xylitol maple syrup. 1. Is xylitol natural sweetener? Xylitol can naturally occurs in some berries but as a sweetener added to foods it is semi-artificially produced. 2. Is xylitol vegan and gluten-free? Yes; xylitol is produced from corncobs, sugar cane or birch wood. 3. Is xylitol produced by using genetically modified organisms (GMO)? It depends on the producer. Many producers claims their xylitol is non-GMO. 4. What is the difference between xylitol, sucrose, erythritol, stevia, sucralose and aspartame? Xylitol has 2.4 kcal/g, sucrose has about 4 kcal/g, while stevia, sucralose and aspartame have no calories. Xylitol can cause bloating and diarrhea, while other mentioned sweeteners do not. 5. Is xylitol toothpaste better for caries prevention than fluoride toothpaste? In one 2014 study in small children, toothpaste with fluoride and xylitol did not prevent caries more than toothpaste with fluoride alone . 6. Does xylitol promote the intestinal candida growth? There is no proof of existence of intestinal yeast overgrowth in healthy humans. 7. Does xylitol consumption increases the risk of cancer? There is no evidence about this.